Zodiac Engineering manufactures folding and fixed-blade knives. The Southern California startup also provides milling, turning, heat treating, tumbling, and precision CNC machining services. Zodiac’s founder, Ken Spaulding, makes aluminum and titanium sling shots, too. With knife manufacturing, imparting the ideal surface finish is especially important. Customers don’t want to see tool paths and marks that are left behind by machining operations. Chamfer tools can deburr and surface finish the pockets in a metal knife frame, but the work time-consuming. That’s why Zodiac switched to NamPower disc brushes from Brush Research Manufacturing (BRM). These nylon abrasive brushing tools are fast, cost-effective, and long-lasting. NamPower technology is also the surface finishing solution of choice for Balzano Knives, a maker of high-quality knives and other bladed tools. Sea Ray is the world’s largest manufacturer of high-quality pleasure boats such as luxury yachts, dayboats, and sports cruisers. 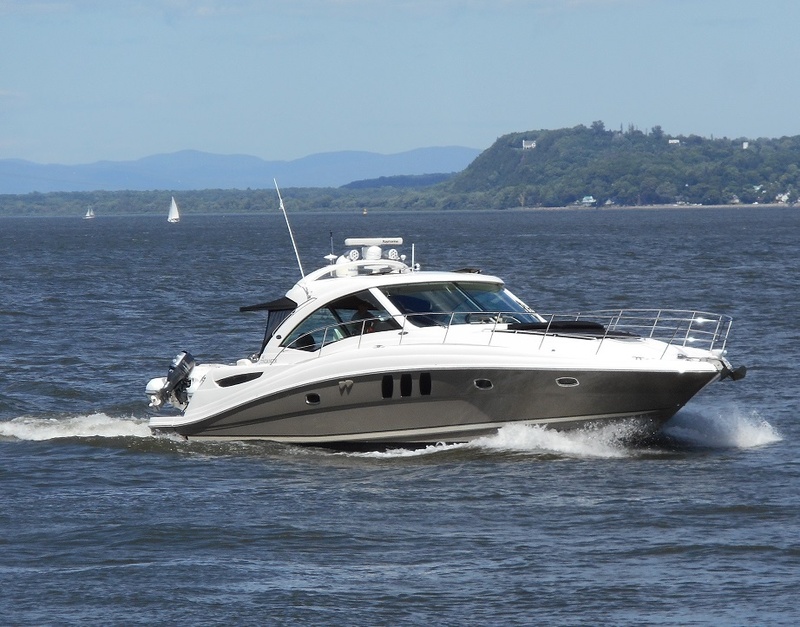 Since its founding in 1959, this American boat manufacturer has prided itself on quality, craftsmanship, and innovation. By integrating industrial robots into its operations, Sea Ray is speeding production and realizing benefits such as reduced costs and increased safety. As part of its automation initiative, the boat manufacturer is eliminating manual sanding by using NamPower disc brushes from Brush Research Manufacturing (BRM). NamPower wheel brushes are great for removing sharp edges from metal parts such as cutting tools, turbine blades, gears, shafts, and extrusion cut-offs. 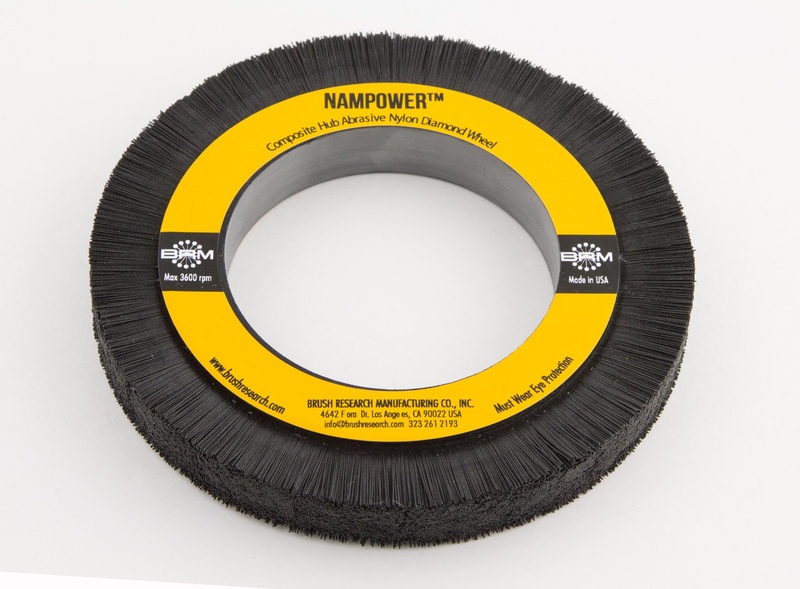 In addition to removing burrs, NamPower wheels create a desired edge radius and impart a superior surface finish. BRM’s NamPower Resource Guide explains how to select and use these nylon abrasive brushing tools, but are they really the right choice for your application? Here are ten reasons to try NamPower wheels for your next deburring, edge radiusing, or surface finishing project. 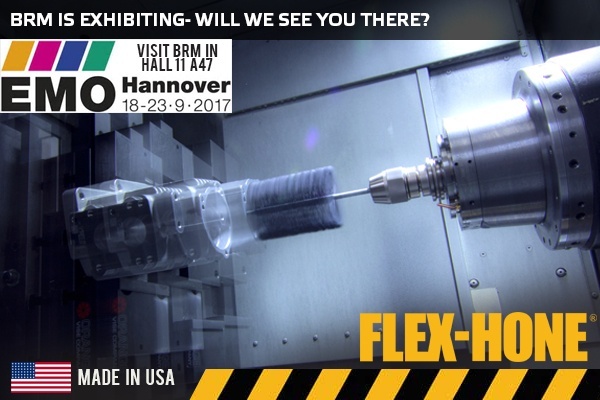 Brush Research Manufacturing (BRM), maker of Flex-Hone® tools and NamPower technology, will exhibit at SOUTH-TEC and FABTECH this fall. 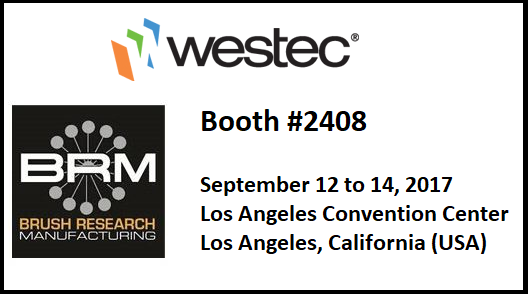 If you plan to attend these industry-leading events, don’t miss your chance to meet BRM and solve your surface finishing challenges. From October 24 to 26, BRM will showcase tools and technologies at SOUTH-TEC 2017 in Booth #1640 at the TD Convention Center in Greenville, South Carolina. 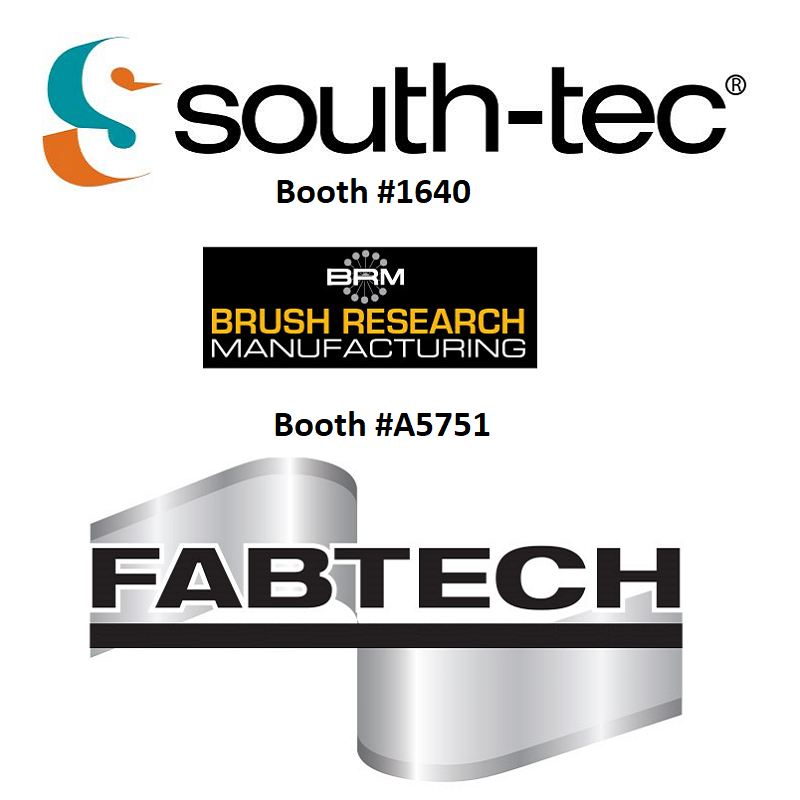 Then, from November 6 to 9, you can meet Team BRM at FABTECH 2017 in Booth #A5751 at McCormick Place in Chicago. There are plenty of reasons to visit BRM at these two tradeshows, but here are three that can help you save time and money. What do knives, boats, and vises have in common? They all need an outer diameter (OD) surface finish that’s smooth, attractive, and burr-free. Otherwise, potential customers may notice small surface imperfections that can lead to larger questions about product quality. For high-performance surface finishing and deburring, NamPower nylon abrasive brushes are the right choice. These disc-shaped brushing tools remove burrs and improve surface finish at the same time. They also blend edges and integrate with today’s production machinery. As the following success stories show, companies that care about quality are getting great results with NamPower disc brushes from Brush Research Manufacturing (BRM). Wheel brushes can remove burrs and improve surface finish, but cutting tool manufacturers need the best tools to get the best results – especially with machined parts made of harder materials. 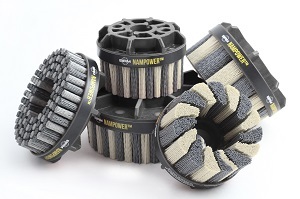 NamPower wheel brushes with diamond abrasive filaments are the right choice to meet this challenge. They control the edge radius and polish the flue reliefs on cutting tools made of CBN, ceramic, cermet, high-speed steel, and tool steels. NamPower diamond wheels can remove hard coatings like nitride, too. Today, cutting tool manufacturers are using NamPower diamond wheels to surface finish and deburr parts such as carbide inserts, drill bits, end mills, taps, reamers, gear hobs, and shapes. What do these part manufacturers know about NamPower than can help you save time and money? 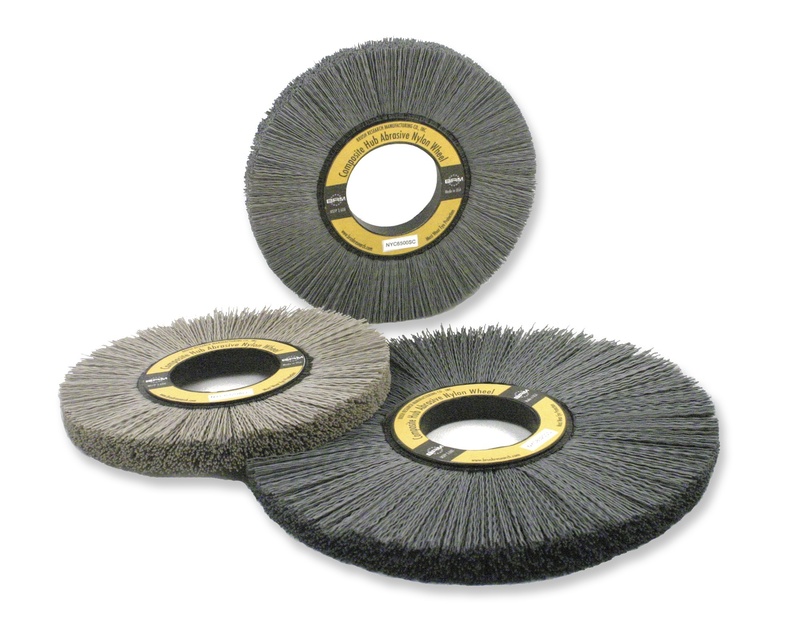 NamPower disc brushes are nylon abrasive brushing tools for parts deburring, edge radiusing, and surface finishing. Manufacturers, machinists, and metalworkers use dot-style tools for lighter-duty applications, and turbine-style tools for medium-to-heavy deburring. Both styles come standard with a unique combination of ceramic and silicon carbide abrasive for maximum burr removal rates and an optimum surface finish at the same time. By special order, NamPower disc brushes are available with blue ceramic or white ceramic alone, or in combination with silicon carbide abrasive. 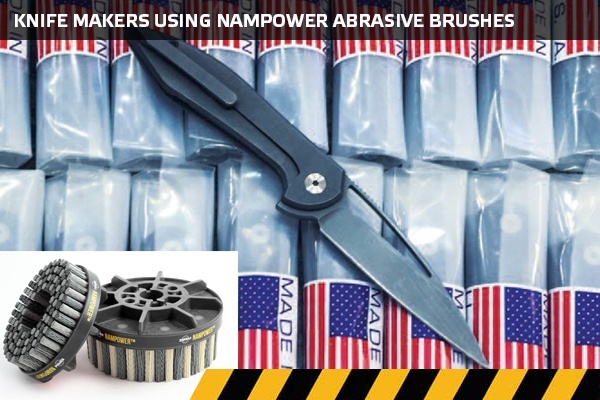 Tool styles and abrasive types are important, of course, but NamPower users who want more aggressive brushing action need discs with shorter trim lengths, larger brush diameters, coarser grit sizes, and denser bristles. Faster disc speeds and increased cutting depths support increased brushing aggression, too. The NamPower Resource Guide provides complete information about tool selection and use, but here's what you need to know about more aggressive brushing with NamPower discs. Metal shafts are rotating elements that transmit power in machinery and equipment. They can be finished to size by turning and grinding, but shaft manufacturers need to impart a final finish that promotes proper performance. Otherwise, friction-related problems can occur. For example, shafts that are too smooth may adhere to plain bearings. Shafts that are too rough are also problematic because of abrasion-induced friction. Wire wheel brushes and non-woven abrasives can improve a shaft’s surface finish, but these tools raise concerns about safety and performance. For superior surface finishing and deburring, shaft manufacturers use NamPower wheel brushes from Brush Research Manufacturing (BRM). These nylon abrasive brushing tools provide important advantages in terms of brush construction and performance.